There is probably no other building that better reflects how Germany perceives itself than the Federal Art Gallery in Bonn – known in German as the Bundeskunsthalle. A gallery devoted to art that is cosmopolitan, transparent, multifaceted and historically aware but that also has an eye to the future. With its dark patinated steel columns, 16 in number, symbolising Germany's federal states and its three eye-catching towers representing the artistic triumvirate of architecture, painting and sculpture, the building designed by Austrian architect Gustav Peichl on Friedrich-Ebert-Allee in the North Rhine-Westphalian city of Bonn – former capital of West Germany and present-day UN city – is as symbolic as it is distinctive. Since 1992 the gallery has hosted important exhibitions in the fields of art, cultural history, archaeology, science and technology. From 'Napoleon and Europe', 'Masterpieces of Classical Modernism' and 'Byzantium' to 'The surviving treasures of Afghanistan', 'Global Change' and 'Arctic – Antarctic', the programme is as multifaceted as the interests of its visitors. 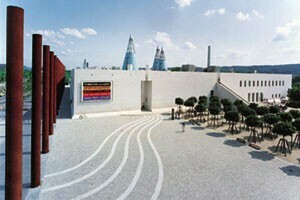 The gallery's forum hosts conferences, symposiums, readings, performances, film screenings, plays and dance performances, and Museumsplatz square serves as a venue for summer concerts. As well as an ever-changing display of sculptures, the rooftop garden has a beer garden and affords wonderful views of the city and surrounding area. At the Federal Art Gallery in Bonn, there is plenty to see – wherever you look. Duomenys apie kainas, terminus ir darbo laiką gali pasikeisti.